On 12 October 1972, a Uruguayan Air Force plane carrying members of the 'Old Christians' rugby team (and many of their friends and family members) crashed into the Andes mountains. 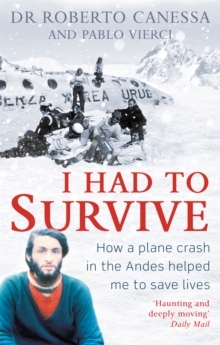 I Had to Survive offers a gripping and heartrending recollection of the harrowing brink-of-death experience that propelled survivor Roberto Canessa to become one of the world's leading paediatric cardiologists. Canessa, a second-year medical student at the time, tended to his wounded teammates amidst the devastating carnage of the wreck and played a key role in safeguarding his fellow survivors, eventually trekking with a companion across the hostile mountain range for help. This fine line between life and death became the catalyst for the rest of his life. This uplifting tale of hope and determination, solidarity and ingenuity gives vivid insight into a world famous story. Canessa also draws a unique and fascinating parallel between his work as a doctor performing arduous heart surgeries on infants and unborn babies and the difficult life-changing decisions he was forced to make in the Andes. With grace and humanity, Canessa prompts us to ask ourselves: what do you do when all the odds are stacked against you?